If you want entertainment on a daily basis, and you’re tired of all the hype in the News headlines, try to follow Alexandria Ocasio-Cortez, the newly elected Representative from the 14th district of New York City, and her wild and ridiculous comments. This gal has no more knowledge of our History, our values, our background, our Constitution, and the interpretation of it than a five-year-old. She is constantly throwing out her terrible hopes and plans for our future. Constantly criticizing a Government and Nation, of which she is totally ignorant. She makes no sense at all. Bernie Sanders is more acceptable than she. How did a person like this get elected? Is this what happens when voters follow the ethnic background, skin color, Religious preference, or anything else other than our National Heritage, our values, and our Constitution when choosing their vote? We are acting more like a third World Country every day. This, my friends, is what happens when the Border is not protected. This is what you get when a bloc of politicians fight to have ANYONE cross our borders. Once here, they are indoctrinated into the ways of skirting the voting process and proceed to support those who promise them the World. They are here for all the “freebies”, and will vote for anyone who promises them a free ride. Speaker Nancy Pelosi, a ranking Democrat in Washington D.C., is running a close second to Ocasio-Cortez, although I must accept the fact that Ms. Pelosi has a good excuse for her ramblings, that being her age. Mrs. Pelosi, in questioning the Presidents manhood, calling the Border wall “immoral”, ignoring the extremely bad living conditions on the Streets of San Francisco in her own State of California, leaves one with a huge question mark above their head, as to her mental acuity. I must consider also, her close alliance with Sen. Chuck Schumer of New York. Mr. Schumer is always found behind a microphone, on the street, constantly berating Pres. Trump, and the Republican Party. Constantly looking down at his written word, and not able to look into the eyes of his constituents or the camera. At the meeting with Pres. Trump, he exhibited a weakling posture, had a constant sneer on his face, and rarely responded in a very intelligent and knowledgeable manner. To know the real Senator Schumer, one has only to review his previous speeches, his comments on the floor of the Congress, and his public appearances before a microphone on the street. His words and actions abound with hypocrisy. I am a Native New Yorker. 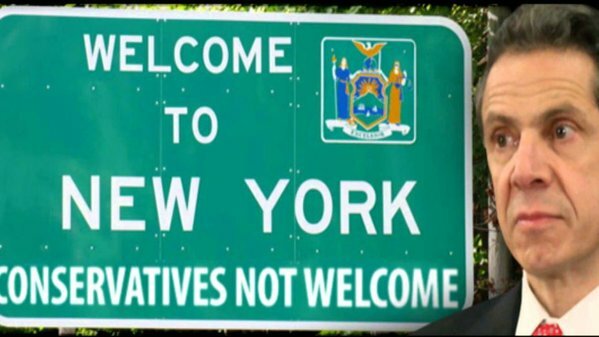 I love New York State, and New York City, but I am embarrassed with the behavior of Senator Schumer, Senator Gillibrand, Sen.-elect Ocasio-Cortez, Mayor DeBlasio, and, oh yes, let me not forget Governor Cuomo. I consider NY to be one of the greatest States in the Union, with a rich and valuable History, but the likes of these Liberal Democrats are slowly destroying the legacy of those before us. Stand up New Yorkers, defend the History and status of our State. We are a strong and outspoken citizenry, and we must now bring forth our reputation. No-one knows better than a New Yorker, how to do battle with ignorance.